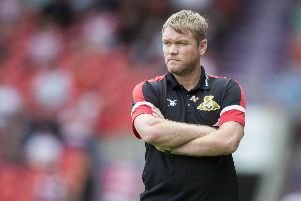 Doncaster Rovers’ squad were subjected to a trial by television in the build-up to tonight’s home clash with Shrewsbury Town. Boss Grant McCann was unhappy with how his side started Saturday’s game at Burton Albion – where Liam Boyce’s 47th minute goal condemned Rovers to their first defeat of the season. And he accepts that the 1-0 reverse at the Pirelli Stadium could act as a ‘wake-up call’ for some of his players after they started the campaign with three straight wins. “The boys watched the first eight minutes of the game – because that’s where we lost the game in my opinion,” said McCann. “We ironed a few things out and made sure we’re all on the same page and we know what we want to do. We did those those things in the second half at Southend and against Wycombe and Scunthorpe. “But we lacked a wee bit of cohesiveness at Burton. “The units weren’t quite connected; when we played out the midfield were high, when we weren’t playing out the midfield were deep. “There were the things that were wrong in our game that we’re usually good at. McCann is expecting a reaction from his team this evening when they host last season’s losing play-off finalists, who are searching for their first win under new boss John Askey. “I think it’ll be a wake-up call for a few,” said McCann, reflecting on the Burton defeat. “I’m not saying we did but you can get a bit over-confident. It’s not the sort of group who would get over-confident and be arrogant. “But you can start to think ‘I don’t have to do this or I don’t have to do that’. “It might just give the boys a little wake-up call.